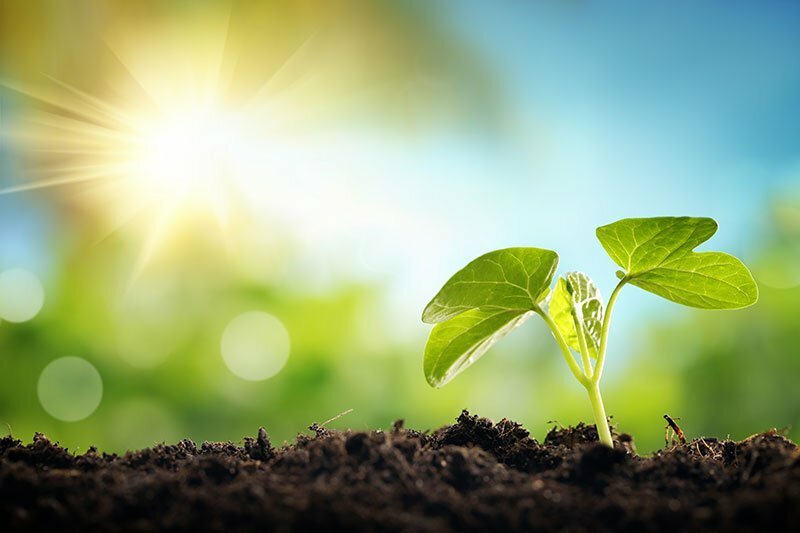 The Indian DAP market is in a quandary over whether to produce the essential fertilizer itself or turn to imports, in what is likely a no-win situation. The latest imported DAP prices, and the cost of production based on the most recently settled prices of phosphoric acid and ammonia, both leave importers and producers making losses given the maximum retail price (MRP) of DAP within India that is set at 25,000 rupees/t (USD 373/t). Moroccan phosphate fertilizer producer OCP settled second-quarter phosphoric acid contracts with its Indian joint-venture partners up by USD 52/t P2O5 at USD 730/t P2O5 cfr. The Indian rupee has depreciated from Rs64/USD to more than Rs67/USD over the past month, so producing one tonne of DAP domestically would lead to a loss of around USD 39/t at current cost levels of phosphoric acid and ammonia, without allowing for a refund on the goods and services tax (GST). Argus assessed the imported DAP India cfr price at USD 429-432/t last week. The knock-on losses for imported DAP are estimated up to USD 2/t, using an exchange rate of Rs67/USD . Consequently, this could lead to mounting pressure on domestic distributors to re-evaluate the current MRP levels, which were raised by Rs1,000/t to Rs25,000/t on 25 April by distributors such as IFFCO, IPL and Zuari. The high phosphoric acid price in the second quarter of 2018 and the depreciating rupee were once seen as a bargaining chip for lower prices into India. But the fast approaching kharif season, together with anticipation of normal monsoon rain as well as low opening stock levels for kharif, mean India’s gamble to wait out the price rise has not paid off. Instead, India has been forced to book a substantial amount of imported DAP, at steadily increasing prices. The import line-up for April-June 2018 stands close to 2mn t. India is expected to import over 5mn t of DAP in the April 2018 to March 2019 financial year. Imports were just above 4mn t in calendar 2017. 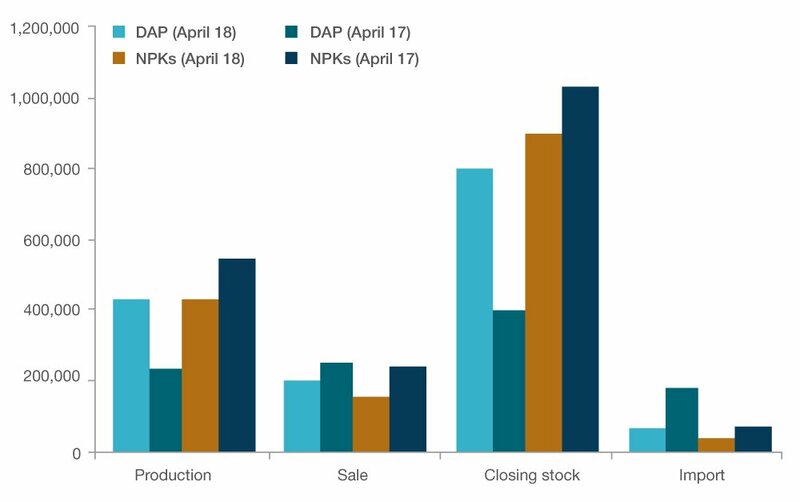 The need for more DAP imports is demonstrated by Argus’ estimates that show DAP stocks of 391,000t at the end of April, down from around 798,000t at the end of April 2017. Port stocks were at 312,000t as of 7 May. The rise in the phosphoric acid price reflects an increase in finished phosphate prices over the first quarter as well as lower ammonia prices for Indian phosphate producers. This led OCP to argue that a higher phosphoric acid price was affordable for Indian DAP producers. As a counter-measure, the DAP fertilizer subsidy has been raised by Rs1,465/t to Rs10,402 (USD 155/t), which has allowed local producers to absorb the higher phosphoric acid cost to some extent. Argus estimates that the domestic production cost of DAP is around USD 409/t (Rs27,580/t), after reflecting the subsidy allowance. But this still compares unfavourably with the current MRP at Rs25,000/t. In dollar terms, the converted cost of imported phosphoric acid, including customs duty and GST, is around USD 397/t (Rs26,593/t). The current average ammonia prices in India are around USD 298/t cfr. The converted costs for 0.22t of ammonia including a 5.5pc customs duty and 18pc GST are around USD 83/t (Rs5,593/t). Other costs for conversion, port charges, finance costs and distribution margin add about USD 68/t to the total cost, including GST of USD 4/t. A subsidy of USD 155/t is allowed at this stage. The above calculation does not account for a GST refund of USD 41/t (Rs2,743/t) which follows on to the inverted tax structure created by the new GST system with effect from 1 July. The refund is calculated by comparing the GST paid on raw materials at USD 60/t, less the GST payable on the finished DAP at USD 19/t. The producer pays GST on phosphoric acid, ammonia, conversion costs, port charges and margins. This can be set off against the 5pc GST calculated on the cost per tonne of DAP after excluding the subsidy. Producers have faced difficulties receiving this GST refund from the government in a timely manner. For imported DAP, the latest India cfr price was assessed at USD 429-432/t, which translates to a loss of USD 1-2/t for those buying. Bagging, port expenses, transportation, finance costs, distributor margins and the GST paid on them add around USD 56/t to the imported cost. If imported at the lower end of the assessed price range, total costs come to around USD 529/t, upon which a subsidy of USD 155/t is granted. 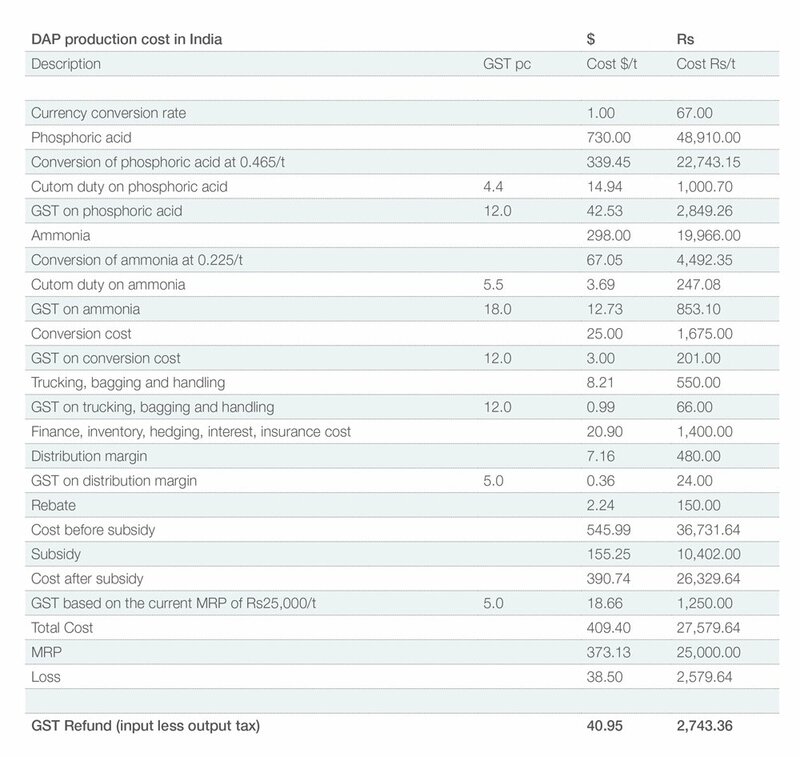 Even so, the resulting cost at USD 374/t (Rs25,059/t) still compares negatively against the MRP at Rs25,000/t. Theoretically, producers fare much better if they use imported phosphoric acid to produce NPK, rather than DAP. Argus calculates the average costs of producing one tonne of 10-26-26 at USD 290/t, purely looking at conversion costs of phosphoric acid, ammonia and potash. The MRP for 10-26-26 has currently been set at Rs23,200/t (USD 346/t). The latest imported Indian cfr price for NPK 10-26-26 was assessed at USD 366/t. This lower cost of NPK production is already being borne out in production data. Provisional data show India produced 225,400t of DAP in April 2018, compared to 427,000t in the previous year. On the other hand, production, imports, sales and closing stocks of NPKs have risen in the corresponding period. Production has risen by 22pc to 538,000t, while imports are up by 85pc year on year to 68,000t. India imported a total of 545,000t of NPKs in 2017-18. Of these, 93,000t was 10-26-26 and around 267,000t was 20-20-0+13S. The Indian meteorological department (IMD) long-range forecast for this year’s southwest monsoon season points to normal rainfall, in what is typically a positive sign for fertilizer consumption. Seasonal rainfall is likely to be 97pc of the long-period average (LPA), with the probability of this happening at 42pc. The LPA from 1951-2000 is 89cm. The IMD defines a normal monsoon season as one in which probable rainfall is 96-104pc of the LPA. Farmers in India are highly susceptible to rainfall during the monsoon season and typically adjust the levels of fertilizer applied to match rainfall levels. 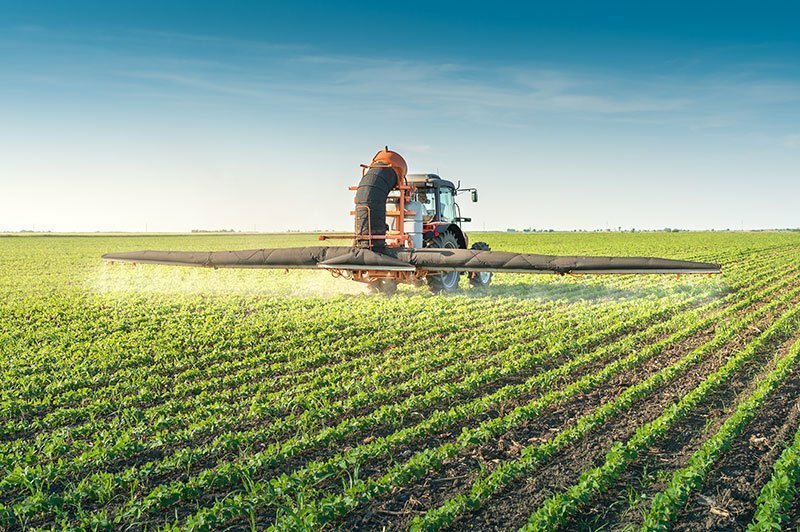 A normal monsoon is usually considered supportive of India’s fertilizer demand, underscoring the need for phosphate fertilizers in the country, despite the high production and import costs. Indian producers and importers face tough times ahead, as they are caught between a restrictive MRP on one side and high costs on the other. The situation is unsustainable in the long run.